It is a wet day in the Peak District today. The rain started about 10am and has hardly stopped. I am running a private course for 3 days with Clive Kornitzer and his son Alex, from London, this was the first day. We started in the Goyt Valley with some waterfalls and a packhorse bridge with a river running underneath it. Then to the Cat and Fiddle pub for lunch, very slow service but not busy despite being Good Friday. The afternoon was a bit of a wash-out with heavy rain and a cold wind. We started walking down to 3 Shire Heads but the rain increased and it was quite unpleasant. The cameras would have been waterlogged if we had tried to take photos so we returned to base early and did a bit of work on the computer in Photoshop. At least with all of this rain the waterfalls, rivers and lakes look great – no shortage of water in these! Here is an image by Clive so you can see day was productive even though it was curtailed earlier than expected. 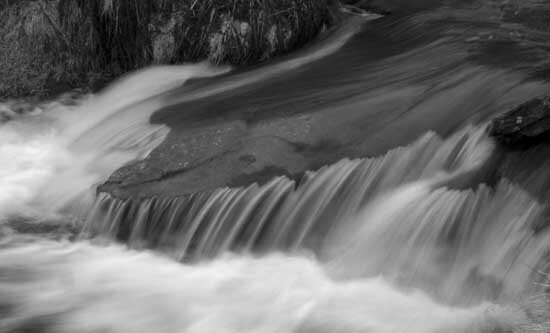 A simple image with some nice shapes and patterns that hang together very well with a bit of space at the bottom for the water to fall into. Alex has some good pictures too perhaps I will be able to drop one or two of those on after another day. Forecast is for less rain tomorrow and a few sunny spells. Hope it rains less, and a bit of sunshine would be good! We had a great day – and have learnt loads – thanks Dave. We are drying out and looking forward to day 2.